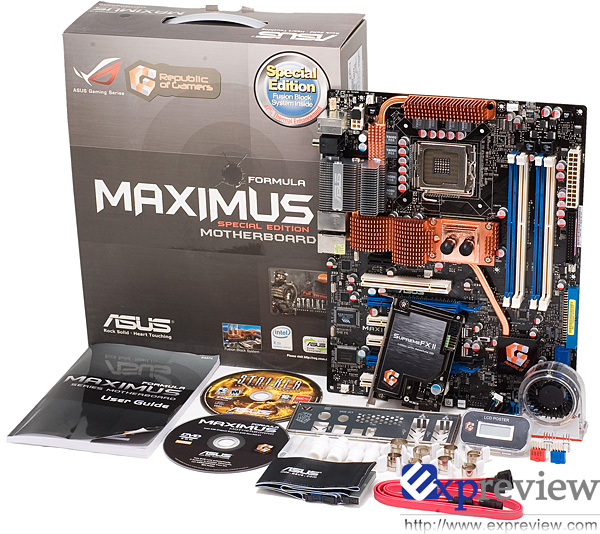 Asus released the new ASUS ROG Maximus II Formula series motherboard. Equipped with an Intel P45 chipset and supporting DDRII memory. A Taiwanese forum has got their hands of several high-quality pictures of the upcoming Asus Republic of Gamers, Maximus Formula motherboard. It’s got a massive heatsink covering the chipset and it’s connected to another heatsink that vents the heat out of the case via the I/O panel. There are several heatpipes connecting the various heatsinks on the motherboard, but it looks like Asus has gone for a traditional PWM design instead of using a digital PWM design like DFI, which takes up a lot less space on the board. The board itself doesn’t look that amazing though, it’s got two x16 PCI Express 2.0 slots, two x1 slots and a third black slot for Asus audio riser card, as well as two PCI slots. Around the back are six USB ports, a FireWire port, a PS/2 port for a keyboard, two Ethernet connectors and S/PDIF out connectors, but no eSATA which is a real bummer. This entry was posted on August 13, 2008 at 9:21 am	and is filed under Asus Rog Maximus. Tagged: Asus Rog Maximus. You can follow any responses to this entry through the RSS 2.0 feed. You can leave a response, or trackback from your own site.